2012 ST. PATRICK’S DAY FESTIVITIES START IN JUST A FEW DAYS!! Join us Saturday for ICY COLD BEER, TRADITIONAL CORNED BEEF DINNER, CLASSIC REUBENS, AND IRISH CHEER! full menu available all day long! Who’s going to win it?! Come watch the Super Bowl at JJ Manning’s Irish Pub! We’ve got the game! We’ve got the Commercials! We’ve got the Half-Time Show! …and We’ve got the ICE COLD BEER AND SUPER BOWL MUNCHIES! Same Great Full Beer, Wine and Kitchen Menu! New Year! New Entertainment! New Menu Items! Catch up with JJ Manning’s Irish Pub! HAPPY NEW YEAR!! JJ Manning’s is wishing everyone a HAPPY and HEALTHY 2012! 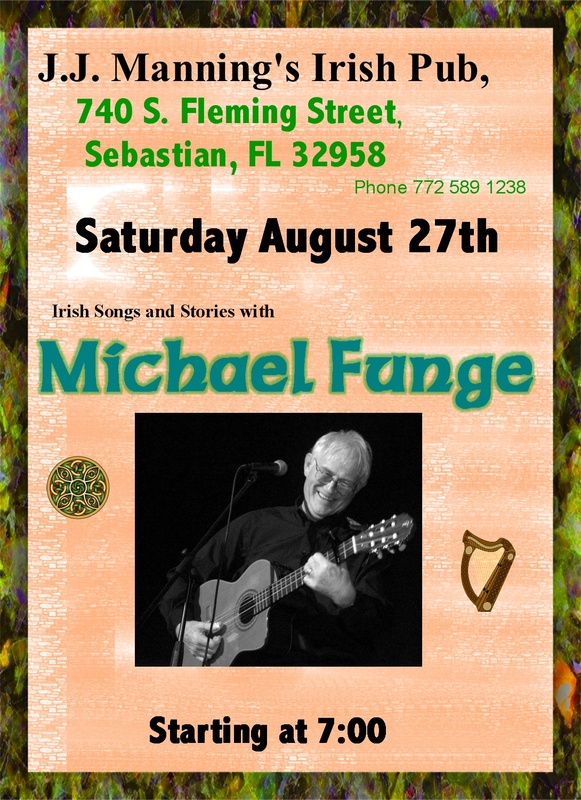 JJ MANNING’S IRISH PUB… Sebastian’s friendliest neighborhood pub! If you haven’t stopped in yet this year, here is what you are missing! *New Featured Wines* Each Month! Come in on Wednesdays and get a complimentary cheese, cracker and summer sausage plate with your purchase of a featured wine! *Pub Quiz Trivia Night* every THURSDAY! Compete to win prizes….and bragging rights! Fun Trivia in categories such as: Sports, Entertainment, Current Events, Science and History. Starts every Thursday at 7 pm! *NFL Ticket!! *Catch all of your favorite teams on our flatscreens! Sunday football playing all day long…. who’s going to the Superbowl? Come watch the playoffs with us! Same great pub, same great people….looking forward to seeing you soon! Gift Certificates Make GREAT Stocking Stuffers!! Happy Thanksgiving Everyone!! To celebrate the Thanksgiving weekend and get into the spirit of the holidays, JJ Manning’s is offering a Black Friday (weekend) Special! We are closed for Thanksgiving but will re-open at 2pm on Friday– See you there! October was AWESOME! Don’t miss November & December’s Entertainment! Saturday October 8th~ 8pm Cliff G.
Saturday November 12th~ 8pm Cliff G.
Saturday January 28th~ Cliff G.
Your NFL Sunday Ticket…All Season Long! JJ Mannings Irish Pub is THE place for all of this season’s NFL Games! Sunday Football airs on several flat screen tvs! Stop by to watch your favorite team! Bring your friends & enjoy our Draft Beer or Sunday Bucket of Bottles Drink Special & snack on our AWESOME beer soaked Brats w/sauerkraut, Wings, Irish Nachos, Chili…. Have you tried the Burgers yet?! Sunday Football airs on several flat screen tvs! Stop by to watch your favorite team! 8/27/11 PUB PARTY ENTERTAINMENT SCHEDULE! LIVE IRISH MUSIC THROUGHOUT THE DAY! Derek Coghlan & Benny O’Carroll DIRECT FROM IRELAND! FOOD & DRINK SPECIALS ALL DAY LONG!! Check out the below links for the pub party entertainment!